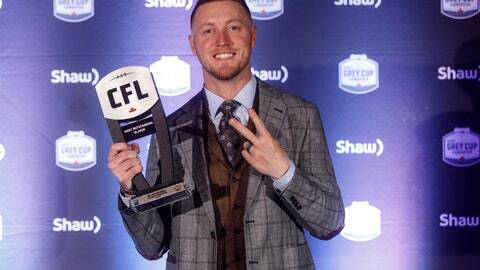 EDMONTON, Alberta (AP) — Calgary Stampeders quarterback Bo Levi Mitchell won his second CFL’s outstanding player award Thursday night. The former Eastern Washington and SMU star from Katy, Texas, also won in 2015. He will lead Calgary into the Grey Cup game Sunday against the Ottawa Redblacks. Mitchell had a CFL-high — and career-best — 35 touchdown passes in leading Calgary to the league’s best regular-season record (13-5). He threw for 5,124 yards. Hamilton quarterback Jeremiah Masoli, the CFL’s second-leading passer with 5,209 yards this season, was the East finalist. Winnipeg linebacker Adam Bighill was selected the top defensive player. The 5-foot-10, 230-pound Bighill also won the award in 2015 with the B.C. Lions. The former Central Washington player had 105 tackles, four sacks, two interceptions and a CFL-high four forced fumbles in his first season with Winnipeg. Ottawa players won three awards. Slotback Brad Sinopoli was named the top Canadian, and kicker Lewis Wards the top rookie and special teams player. Ward made 51 of 52 field goals, including a pro football-record 48 straight that will carry over into 2019. Winnipeg tackle Stanley Bryant captured the top lineman award for the second consecutive year. Chris Jones of Saskatchewan Roughriders was the coach of the year.